Krishna, probably the most important of the ten incarnations of Vishnu, is believed to be Vishnu himself by the Vaisnavas. From his early life given in the Harivansa, Vishnu Purana, bhagavat Purana and other Puranas we know that he was the son of Vasudeva of the Yadav clan then living in Mathura. Vasudev's wife Devaki was a cousin of Kansa, the most dreaded king of Mathura. The high sage Narada, a roving seer of extraordinary insight into times past, present, and future, had pro-phesied that Devaki's eighth son would kill Kansa. He, therefore, im-prisoned Vasudeva and Devaki, and killed the children born to them. The seventh child, Balaram was, however, miraculously saved. Vasudeva slipped out of the prison with Devaki's eighth son, born one midnight, and exchanged him with the newly-born daughter of Yasoda, wife of Nand, the chief of the cowherds who were camping across the Yamuna. Next morning when Kansa found that Devaki had given birth to a daughter, he killed the infant who was actually Devi or Yogamaya. She went up the sky and informed Kansa that the person who would kill him was born and being brought up at another place. Kansa found out where Krishna was and sent many demons to kill him, but Krishna overcame them all. He grew up among the cowherd boys and girls, his loves and dalliances with the latter being the subject of a vast literature in later years. 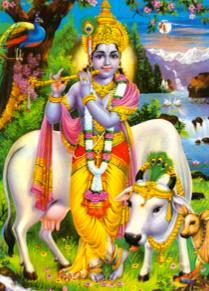 Among the cowherd maiden, Radha was no doubt his favorite. The Vishnupuran describes Kaliya as a snake with many heads living in a pool of water near Vrindaban. As he had poisoned the pool with his potent venom and killed many of Krishna’s friends, the cowherds and their flocks, he rushed to their aid, revived them and danced on one of the snake's many heads. When Kaliya's friends and relatives begged for Krishna’s mercy, the snake was spared to become one of Krishna’s votaries. The same Purana relates the story of Krishna asking the cowherds to start the worship of the Govardhana, a low hill in the Mathura district, and stop adoring Indra (Indra-yagna). Perhaps the most popular of these stories are about his skill as a flute-player. This adds considerably to the pastoral character of many of the Krishna stories. . . . On hearing the music of Krishna’s flute, peacocks dance and other animals stand still and worship him with their glances. . . .